Unfortunately the most common cause of heatstroke in dogs is easily the most avoidable. Careless owners leaving their pets in the car is the number 1 cause of heatstroke. Even on an average summer day when the outside temperature is 22°C the temperature in a car can rocket to a stifling 47°C in less than an hour with the sun beating down. A cracked window and a little water doesn’t make it ok – never leave your pet in the car, even in the shade. Regulate the temperature in the car with the air conditioning. Dogs and cats have thick fur which means they retain heat much more than we do. Don’t forget often in the boot of your car it will be sunny while the front of the car where you are is in shade. Install sun shades if they do not obstruct the drivers view. Use our travel bowls to provide a constant water supply. Take regular breaks on long journeys to allow your pet to relieve themselves, stretch their legs and get some fresh air. But it’s not just car journeys which pose a problem. Is your garden providing enough shade? Many pets spend a lot of time enjoying the garden, and so need an area of shade throughout the day. A kennel with a covered patio area can be a good option as are sun protection nets for small pet runs and cat houses. A summer haircut will help particularly fluffy cats and dogs as well, in the same way sheep are sheered for summer your dogs and cats can be styled and trimmed using clippers or scissors which are easy to use and designed to avoid any nicks or cuts. Use a FURminator for cats or dogs to thin out and moulting fur regularly. Shade – Get them to a cool shady area. Prevent – Follow our tips above for travel and garden safety during the summer. 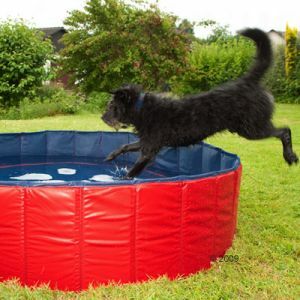 If your dog is prone to overheating you may want to get a doggy pool for the garden for them to splash about in and cool off. If you suspect your dog may be starting to suffer from heatstroke get them in the pool. Water – Provide a bowl of water and encourage regular drinking to re-hydrate. Cool off– Use towels soaked in water to cool their head, paws and body. Do not use very cold water or ice as it can shock your pet. Hose down -If your dogs condition is not improving cooling them more quickly is important so if possible use a hose with a steady trickle, first checking the temperature is not too cold. Getting your them to the vet – If you can’t get an emergency vet to come to you try to stabilise your dog first so their condition isn’t getting worse, start up the car and get the air conditioning running and the car cool before moving your dog into the car. Dogs and cats get sun burn and skin cancer in the same way as humans, especially those with white fur, thin fur and on exposed areas such as tips of ears and noses. Cats will go out for the day and like us humans will not notice they are burning until it is too late, apply some sun screen before they go out and likewise with your dog if they will be spending time outside. A shady area of the garden with a Keep Cool dog & cat mat will make a welcome retreat for your pet in the heat of the day. Dehydration in cats and dogs is a serious problem, cats especially are prone to kidney damage from drinking too little. Ensure there is always a source of clean and fresh water in your home for your cats and dogs and if your cat is allowed out during the day then leave water outside which they know they can come back for if they are thirsty. 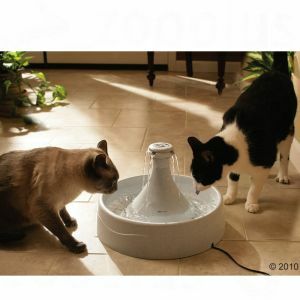 Cats and dogs can be fussy with the water they drink, so why not try a water fountain? Fountains work by constantly moving the water through a series of filters, which oxygenates the water and keeps it tasting fresh for a number of days. Plenty of fresh water will help to keep your dog or cats kidney function high and also helps avoid urinary crystals. 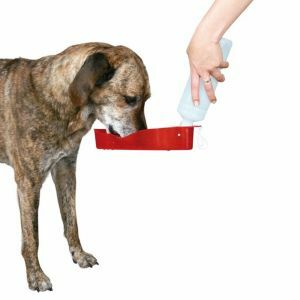 If your pets still don’t seem to be drinking enough, especially at meal times, you may also want to consider switching to a wet cat food or wet dog food as some pets prefer to get much of the water they need this way. This entry was posted in Cats, Dogs, Pet Health and tagged cats sunburn, dehydration in cats, dehydration in dogs, dogs sunburn, heatstroke in cats, heatstroke in dogs, keep cats cool, keep dogs cool, spot heatstroke in cats, spot heatstroke in dogs, summer cat accessories, summer dog accessories by zooplusuk. Bookmark the permalink.